The term "living like a caveman" is plastered all over the mainstream news these days, drawing in folks who are curious about this new "caveman diet." The media has become inordinately curious as to how so many people can overcome burdensome weight problems and scores of health issues by adopting an eating plan that is essentially a rejection of modern food convenience and a return to sanity through personal responsibility. The paleo or "primal" lifestyle is receiving an abundance of attention because enquiring minds want to know more about it. The main thrust behind the paleo or primal lifestyle is that we humans are hunter-gatherers, and our genes are partial to the real food just like our ancestors. We have not evolved to adapt to the heavily processed, high-carbohydrate, grain-loaded, industrial oils-based garbage diet of the modern era. Those of us who reject this conventional diet negatively refer to it as the Standard American Diet (SAD). The effects of this food have been devastating on all of human health, and not only in America. Everywhere the SAD is embraced, people are suffering all of the same afflictions associated with modern western civilization: obesity, diabetes, inflammation, autoimmune disorders, heart disease, cancer, ambiguous mental disorders (such as depression and anxiety), and dubious behavioral disorders. 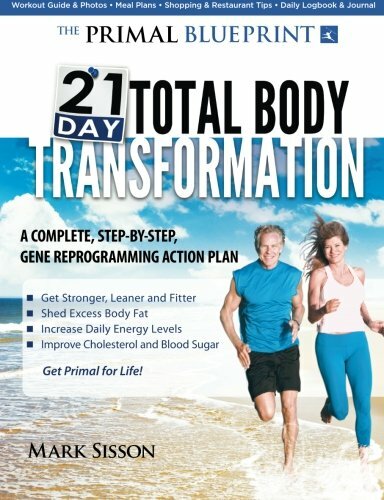 Mark Sisson's newest book, 21-Day Total Body Transformation, is not a gimmicky guide for daft dieting and short-term sculpting. Instead, it's a book on how to live real — eating real food, employing real movement, and adapting to your modern life through the application of evolutionary principles. The book not only challenges the Standard American Diet, but it also rejects the overly-stressful and time-consuming exercise patterns that have become common practice for folks who struggle to lose weight through fitness. Both movement and food are crucial elements in transforming your health, and Sisson places a high emphasis on diet because years of disinformation, from the scientific community as well as the government-media establishment, have confused an issue that is actually very straightforward once you come to understand some of the basic concepts. Don't let the book's title mislead you — the 21-day transformation is not about going from out-of-shape to svelte in three weeks so you cram yourself into those undersized clothes hanging in your closet. Instead, Sisson describes the book as a 21-day adventure, or transformation, to eliminate old habits and replace them with new ones. He calls it a transformation "that will last for the rest of your life." This transformation is best described as a move from the Standard American Diet and futile chronic exercise to primal, evolutionary-based practices that take the most advantageous conventions from our ancestors and reshape them for modern life. Sisson calls this "dialing in your eating, exercise, sleep, and play for the rest of your life." 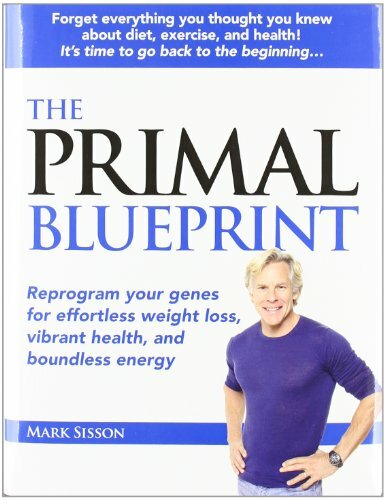 This book is a follow-up to Sisson's mega-selling 2009 release, Primal Blueprint, for which Mark received many accolades for the book's originality and precise message. For many folks, however, adopting new habits, after a lifetime of established routines, presents them with a thorny challenge without a blueprint to guide their action plan. This book serves that purpose. Sisson lays out the framework by introducing eight key concepts that form the core of the transition from one who engages prevailing practices to a freethinking and empowered individual. Adherence to these concepts will serve to reform the reader's habits and establish some new ways of thinking that supplants conventional wisdom. The eight key concepts are, in summary: (1) reprogramming your genes through choices (2) discovering optimal gene expression, or finding your own perfect recipe for health (3) transitioning from a carbohydrate-based metabolism to a fat-burning metabolism (4) controlling body composition through food quality (5) understanding why grains are unnecessary (6) unraveling the lies and myths about fat (7) knowing the role of exercise in weight management, and (8) maximizing fitness with minimal time. Sisson lays out five action items to drive these concepts home, and these include taking steps to eliminate SAD foods; shopping, cooking, and dining; making the right food choices; exercising primally; and slowing life down in favor of balance and relaxation. The tail end of the book provides the reader with the 21-day challenge. I like these challenges, not only because they are relevant, but also, they are simple and will consume very little time on the part of the emerging primalist. For instance, Day 1 includes my favorite challenge of all, and that is the kitchen/pantry purge. This is, as Sisson calls it, the elimination of any "SAD foods that may be lurking in your house." This can be a really fun event. I remember doing the purge years ago when I let it rip and separated myself from the industrial-convenience food machine. My only regret is that I didn't take photos of the wasteland of processed foods that I pulled from every nook and cranny of my kitchen cupboards and freezer. A photo of the post-purge gathering can be a fun — and enforcing — reminder of our propensity to blindly follow conventional wisdom because we are not armed with enough knowledge to repudiate it. Sisson aims to arm you with that knowledge without having to wade through mounds of scientific research and oodles of books. A theme throughout the book is one of personal responsibility, or ownership. Who owns you (I can tell you it is not Cargill or the FDA) and who should be responsible for you? For those of you who work in a corporate environment, you will often hear about the notion of "ownership" — that is, owning one's business processes, decisions, and outcomes, and not evading that ownership for purposes of avoiding accountability. The saying goes, you need to "own it." As a flourishing human being, before you can own the responsibilities that have been delegated to you, you have to own yourself. Self-ownership demands personal responsibility. You are responsible for you, meaning you control your own body and life. When individuals don't "own" their own actions and outcomes, there tends to be a lack of answerability and things tend to get mucked up pretty quickly. One thing is clear about the SAD – individuals adhering to it have given up responsibility for their own health and they have delegated authority for life-and-health decisions to umpteen food manufacturers and feedlot farm operations while they put their trust in public health bureaucrats and believe that anything sold as "food" must be consumable, and therefore not harmful. Most SAD disciples have never bothered to try and understand the ingredient list on the products they buy — a simple task that takes only a small effort. How did a culture born on a model of independence ever get so far away from its people owning themselves and being responsible for their own quality of life? As 20th century lifestyle "progress" took hold (eating food from factories instead of farms, driving instead of walking, etc. ), and waistlines began to expand, Conventional Wisdom dispensed the flawed observation that eating fat makes you fat. We were convinced, erroneously, that carbohydrates (and the glucose and stored glycogen they generate) are what are bodies prefer to burn, because they burn quickly and easily, and because certain vital organs like the brain cannot live without them. Consequently, industrious food manufacturers revved up their machinery to pump out heavily-processed carbohydrate foods and beverages. We cultivated and indulged our collective sweet tooth, and assuaged our health ambitions by eating low-fat, grain-based meals that we truly believed were nutritious and responsible for weight control. While the nuances of this issue might be debated by those in the whole grain, low-fat camp today, one unassailable truth is that the Standard American Diet of the past few generations has been an unmitigated disaster. Following these comments are several pages of indispensable material on why fats and proteins are the preferred macronutrients over carbs, and how you can turn from a sugar burner into an efficient fat-burning organism. There is one item in the book that has a special meaning for me personally, and that is one of the success stories that Mark highlights on page 65, where he writes about Timothy Williams. Mark writes, "Timothy stumbled upon MarksDailyApple.com in early 2010 and was immediately intrigued by the primal theme due to his background as a student of anthropology and early humans." My story is this: in early 2010, Timothy came across an article of mine on LewRockwell.com, Primal Life: A Journey of Diet and Health, and that's when he first reached out to me and told me about how ecstatic he was to learn about Mark Sisson's blog, which I had mentioned in my article. I corresponded with Timothy, over time, after he wrote me about his success story in going primal. Timothy, who was chunky but certainly not obese, turned his health around and wiped out scores of health problems that were quickly diminishing his quality of life. Each time he wrote to me, he was brimming with joy and his letters displayed an extraordinary enthusiasm for his newfound knowledge and health autonomy. Mark Sisson quotes him as saying that going primal was akin to going through a second puberty. His letters always left me with the reminder of the lives we can change, for the good, through dedication to the facts and the guts to stick to the unpopular truths. Throughout the book, Sisson's theme is unwavering — educate yourself, own your decisions, always question the conventional wisdom, and avoid dogmatic behaviors. With all of its concepts, summaries, success stories, resource lists, and color-coded sections, the book is organized like a study guide but grabs one's attention as much as any gripping novel. I love the fire and spirit exuded by the very passionate and eloquent Sisson. Moreover, the simplicity that Mark Sisson utilizes in this book is crucial, and that's because people in the modern world are excessively consumed with work and tasks and they don't desire to take on time-consuming chores that promise the world and return nothing, such as with conventional diet books. Mark offers a structured and uncomplicated system for individuals to align themselves with their evolutionary strengths and optimize their quality of life through the use of graduated steps that change behavior and build good habits. I would point out some flaws if I found any, but my search didn't turn up anything interesting. As an ex-printer, I can point to the nice cover photo that appears to be washed out and a bit ashen for some reason, and that is something I hope would get a second look in a later printing. That aside, the attractiveness of the book is, like every Sisson book, the result of some very talented people who know how to churn out a readable and gorgeous production that adds value far beyond its cost. Eating right — real, whole foods — is so simple, yet so misunderstood, and most people don't have a clue where to start. Fighting through the food demons and exercise mythology is not always a clear path at a time when there is so much conflicting information being cranked out from second-rate sources and so-called "health experts" are ramming conventional nonsense down the collective throat of the disoriented populace. 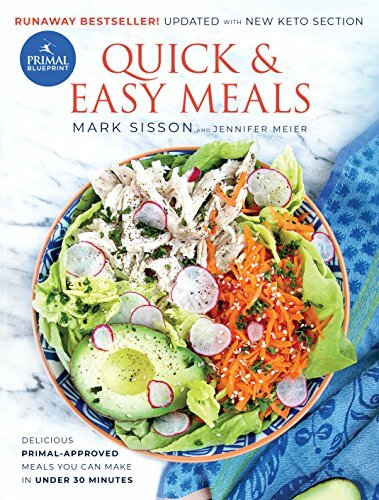 Mark Sisson does an exceptional job of cutting through all of the unnecessary noise and getting to the nucleus of lifestyle transformation without all of the stress of adhering to mindless routines, calorie counting, and diet-fail guilt. That's why this book is a great tool for the curious, the confused, the downtrodden, and all of the folks who churn away on hamster wheels while staring out the glass windows of a multimedia gym factory, with no results to show for all of the effort. Karen DeCoster, CPA [send her mail] is an accounting/finance professional in the healthcare industry and a freelance writer, blogger, and speaker. She is also a member of the Board of Directors of Belgian Publishing, Inc. She writes about libertarian matters, economics, financial markets, the medical establishment, the corporate state, health totalitarianism, zeitgeist, Detroit, and Flemish interests. When she has a few moments of spare time she enjoys cycling, paddling sports, photography, conversations with friends, iPoding, doing stuff with guns, visiting wine regions, and miscellaneous pursuits in her woman cave. This is her LewRockwell.com archive and her Mises.org archive. Check out her website. Also see her blog Detroit: From Rust to Riches. Follow her on Twitter @karendecoster.